When you already stuff your face with delicious pizza more often that you're willing to admit, "food holidays" like National Cheese Pizza Day don't really count for much. National Cheese Pizza Day could be any given night at your place, right? Well, it turns out the actual National Cheese Pizza Day arrives on Wednesday, September 5, and it comes with pizza deals that'll make it better than your average pizza night. Several chains -- Cicis, Domino's, Pizza Hut, Papa John's and others -- are offering ways to celebrate with new pizza specials specifically for the cheesy occasion or ongoing deals for free or discounted pizza. This doesn't mean you should show up at your local pizzeria demanding a complimentary pie, but there are plenty of appealing deals to be had from national chains. Of course, it's also worth calling your favorite local or mom-and-pop pizza restaurant's to see if they're doing anything special as well. The deal: Participating locations of the pizza buffet chain are celebrating the occasion by offering large 1-topping pizzas to go for $5. All you have to do is place your order through the MyCicis mobile app. The deal: With the chain's popular "Mix & Match" offer, you can get any two or more pizzas, pastas, bread bites, boneless chicken wings, and more for $5.99 each. You can also get large, 3-topping pizzas for $7.99 if you're able to swing by your local Dominos for a carryout order. Additionally, Domino's is giving away five $100 gift cards on Twitter as part of its back to school celebration through September 5. The deal: Get ready for tons of extra cheese. The bake-it-yourself pizza chain will treat you to a large signature cheese pizza when you order any other pizza online. Just use the code CHEESY. The deal is limited to one free pizza per person and there's a chance your local Papa Murphy's may not be participating in the offer, so you may want to call and double check before you cancel your dinner plans. The deal: This theater chain is serving up a deal for buy-one-get-one free (BOGO) pizzas. It's easy: Just buy a pizza and they'll throw in another one. The deal: When you order online, you can get large 2-topping pizzas for $7.99 each. The deal: The controversy-prone pizza company has two deals for National Cheese Pizza Day: 1) Get a 1-topping pizza -- large or pan -- for $7 with the code LG1TOP7 and 2) get an order of 10-inch cheese sticks for $5 with the code CHEESELOVER. Additionally, Papa John's has a few ongoing deals worth checking out, including its new Italian Hero pizza for $10. You can also get an extra-large 1-topping pizza and an order of donut holes for $15, or a large specialty pizza and a large 2-topping pizza for $22. The deal: Instead of a traditional pizza deal, the chain is running a free pizza sweepstakes on Facebook. Like, comment, and tag two of your friends on this post on Facebook and you'll be entered to win free pizza for a year. The deal: Meat lovers, rejoice! You can get the chain's new, limited-edition 5 Meat Feast pizza -- topped with pepperoni, bacon, sausage, beef, and ham -- for $9. The deal: Indulge in a massive cheese pizza from the southwest-based pizza chain Streets of New York Pizza. 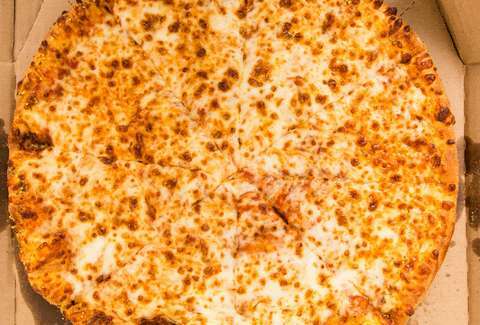 It's offering a 16-inch cheese pie for just $12 all day in honor of National Cheese Pizza Day. No code is required. Additionally, police, firefighters, and military personnel get 15% off orders in an ongoing deal. If you know of any National Cheese Pizza Day deals we missed, shoot us an email to news@thrillist.com and we'll add 'em here. Want more free food and food deals? Here's our running list of all the free food you can get right now. Tony Merevick is Senior News Editor at Thrillist and celebrates every day like it's National Cheese Pizza Day. Send news tips to news@thrillist.com and follow him on Twitter @tonymerevick.